Nosto is the world´s fastest-growing personalization solution. Today the Shopware partner gives you tips how to generate up to 20x ROAS from Social Advertising. Companies investing money in the attraction of new customers is nothing new. In fact, ecommerce merchants have been shown to spend an average of 90% of their marketing budgets on customer acquisition alone. But with the advent of social media, the battleground on which they compete for these customers is changing. The result? Up to 20x ROAS on your social media advertising efforts. An impressive figure indeed and one that is sure to speak to those that hold the advertising purse strings. But personalized social media advertising is more than just a quick win -­ it also increases brand engagement, loyalty and ultimately the customer lifetime value. You may be thinking that social media, with it’s multi-­faceted targeting options should be enough. What could personalization then bring to the table that delivers such results? Well, while social media segmentation options have allowed you to target relevant groups with pre-­set messages that you have deemed to be relevant, personalization looks to take your efforts a step further and attend to the individuals within these groups based on real-­time behavioural data. 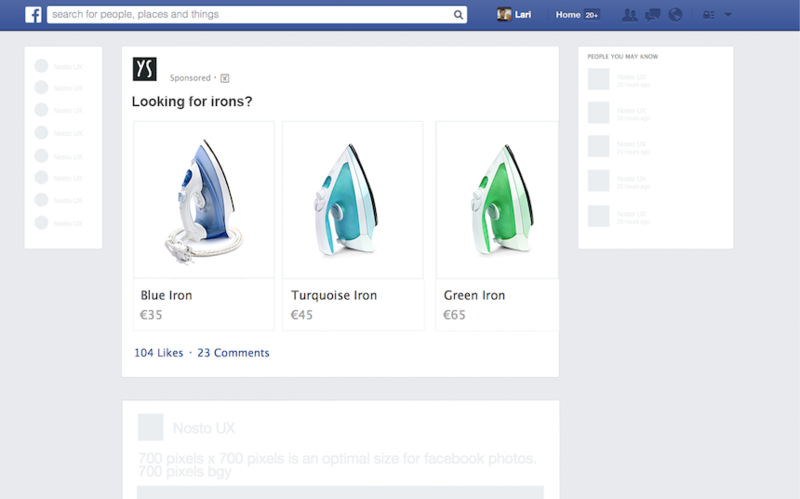 This results in product level ads, tailored for each person. You are a greeting card company who wants to attract new customers. You don’t want to use a generic ad but you haven’t got any information specific to the people you want to attract because they haven’t interacted with your site yet. You use third-­party software to automatically generate an ad which shows the most popular items in your store right now. These items are the most relevant at any one time and so therefore the most likely to convert. 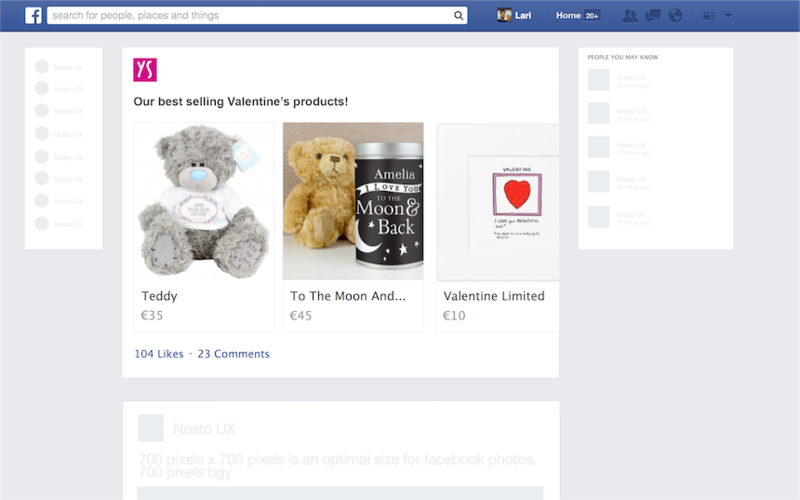 Valentine’s day is coming up and so the demand for Valentine’s cards and small gifts is high-­ your advert is automatically populated with these items, therefore reflecting current trends. A customer comes to you store and looks at a couple of irons but then leaves the site. This data is captured either by a tracking pixel or by a third party piece of software. 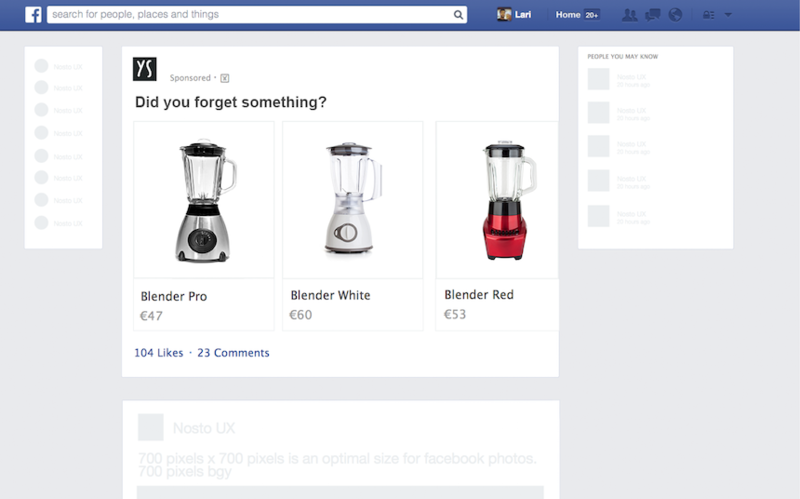 When they return to their social media pages or go to browse on other websites they see an advert that is automatically populated with the products that they previously looked at. A shopper comes to your store looking for a blender. They add one to their cart but get decide to to check out this product in other online stores. Normally this data is wasted but that need not be the case: once they leave your store their buyer profile is now captured so they can be recognized across the web, with any ad spaces you chose to target them on (eg their Facebook newsfeed) immediately populated with the items they abandoned, together with other related pieces. ** Compared to US average Facebook ad performance. Calculation based on figures from The Facebook Ads Benchmark Report by Salesforce, 2013. Nosto is the fastest-growing personalization solution in the world, enabling online retailers to deliver their customers personalized shopping experiences, wherever they are. A SaaS solution, Nosto’s ease of use and speed of implementation empowers retailers to start growing their businesses within minutes of getting started, increasing conversion, average order value and customer retention. With offices in New York, London, Berlin and Helsinki, Nosto is used by over 15,000 retailers across the globe including Volcom, LUSH and The ICONIC.